The world of tablet computers is one of the fastest expanding areas in consumer electronics and it is easy to see why: they are mobile, stylish and powerful enough to meet most people’s computing needs. The Kindle Fire is a fully-fledged tablet that has evolved out of the Kindle eReader that was originally designed for reading books, newspapers and magazines. The Kindle Fire HD, and HDX, take this several steps further, with functionality to: surf the web and access your favorite social networking sites; use email; listen to music; download apps; play games; watch movies and TV shows; and read all of your favorite books. The Kindle Fire HD and HDX are Amazon products and most things on them are linked to Amazon in one way or another. 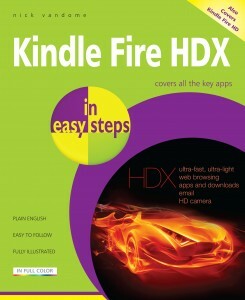 To use the Kindle Fire HD and HDX to its full potential you need to have an Amazon Account with a username and password. If you do not already have one this will be set up if you buy your Kindle Fire HD or HDX from the Amazon website or, if you buy it from another retailer, you can create an Amazon Account during the setup process. Most of the content in terms of books, movies, music and apps comes from the Amazon online store, although there are some items that you can also upload to your device. The Kindle Fire is available as either an HD or an HDX model: the HD has a 7-inch screen and the HDX has either a 7-inch or a 8.9-inch screen. The Kindle Fire HD has 8 or 16GB of storage and the HDX comes with 16, 32 or 64GB of storage, so the whole range is powerful enough to be able to store the content you need, whether at home or on the move when traveling. The Kindle Fire HD and HDX easily hold their own against the expanding range of tablets on the market and they are an excellent option for anyone who wants to upgrade their current tablet or dive into the world of tablets for the first time. Kindle Fire HDX in easy steps guides you effortlessly through the world of the both the HD and HDX models of the Kindle Fire. It introduces the revolutionary Carousel and Grid for organizing and viewing all of your content on the devices and shows you how to navigate around the interface. All of the functionality is detailed, including using the Kindle Fire HD and HDX for listening to music, viewing movies and TV shows, downloading apps, taking and displaying photos, reading books, surfing the web and communicating with email, messaging and social networking sites. It also shows how to use the online Amazon Cloud Drive for uploading your own content, that can then be transferred to the Kindle Fire HD and HDX. There are also some useful security features, including the Kindle FreeTime option, that can be used to limit access to certain types of content for children.